If your ideal job involves clocking in at 9 and heading home at 5, good luck finding it. According to new research from tax and consulting firm EY, people across the globe are working longer hours than ever before. In a global survey of 9,700 adults between ages 18 and 67, nearly half (46%) of managers around the world reported logging more than 40 hours a week, and 40% said their hours have increased over the past five years.Americans have it particularly bad: 58% of managers in the US reported working over 40 hours a week. The only country where people work longer hours is Mexico, where 61% said the same. 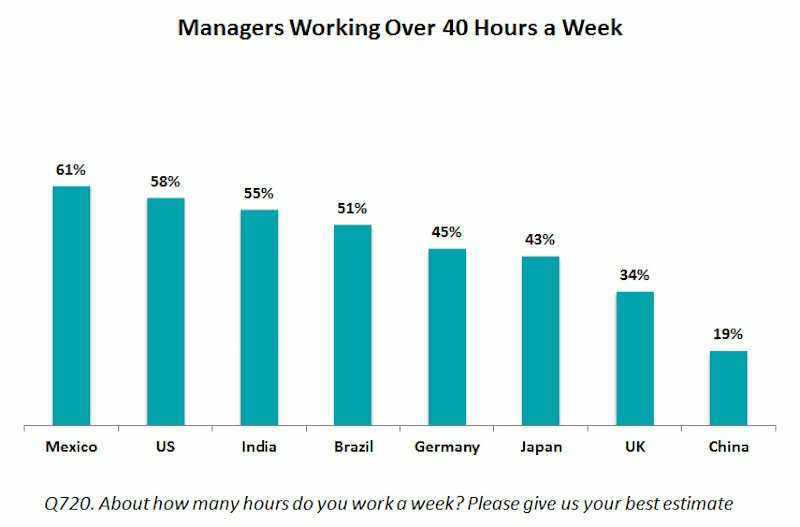 Compare that to China, where just 19% of managers said they work over 40 hours a week. The survey found that parents have seen their hours increase more than nonparents. Among managers, 41% of full-time working parents said they've seen their hours increase in the last five years, as opposed to 37% of nonparents. So it's of little surprise that one-third of full-time employees said it's gotten harder to balance work and family in the past five years. In fact, while most people said they value flexibility at work, about 10% of US employees who have tried to implement a flexible schedule said they've suffered a negative consequence, like being denied a promotion, as a result. Companies would be wise to rethink their flexible-schedule policies if they want to retain workers. More than two-thirds of respondents said they would consider quitting a job if their boss didn't allow them to work flexibly.